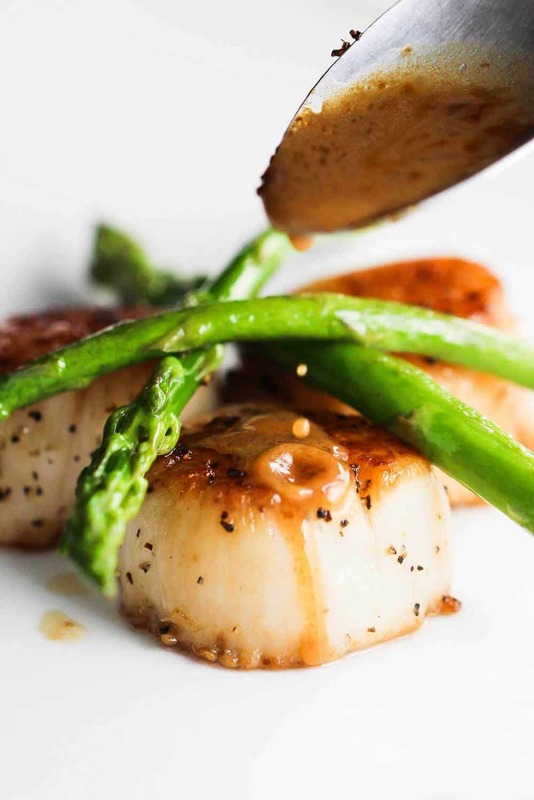 Oh, this Seared Scallops with Asparagus recipe is just wonderful. It’s so, so good. This is one of those show-stopper dishes that also comes together in about 30 to 40 minutes. Just incredible. 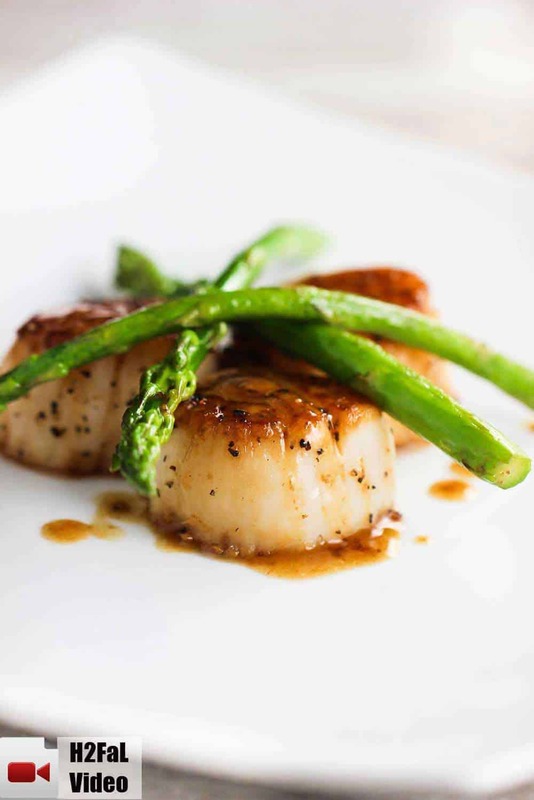 Watch us show you how easy it is to make this incredible Seared Scallops with Asparagus recipe. Of course, it all starts with beautiful scallops. We just love using the large sea scallops. They are absolutely perfect for searing, and are even healthy for you in that they are low in calories and an extremely healthy source of protein. But beyond that…they are melt-in-your-mouth delicious. There are not a lot of ingredients in this incredible dish, but the simplicity is what makes it shine. The asparagus pairs perfectly with the scallops. And the sauce? Oh….the sauce. Olive oil, white wine, white wine vinegar, and butter. With a dash of salt and pepper. Simple, but oh so good. 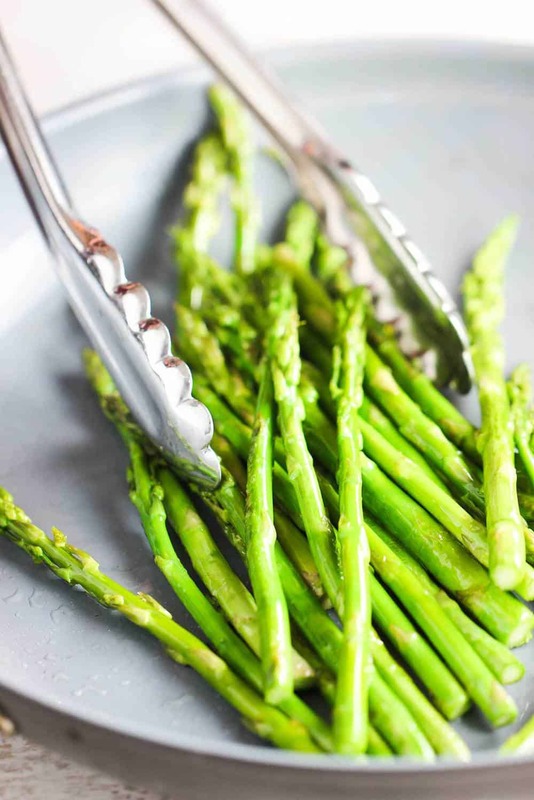 And asparagus is so flavorful and only needs a bit a sauce to compliment the taste and texture. 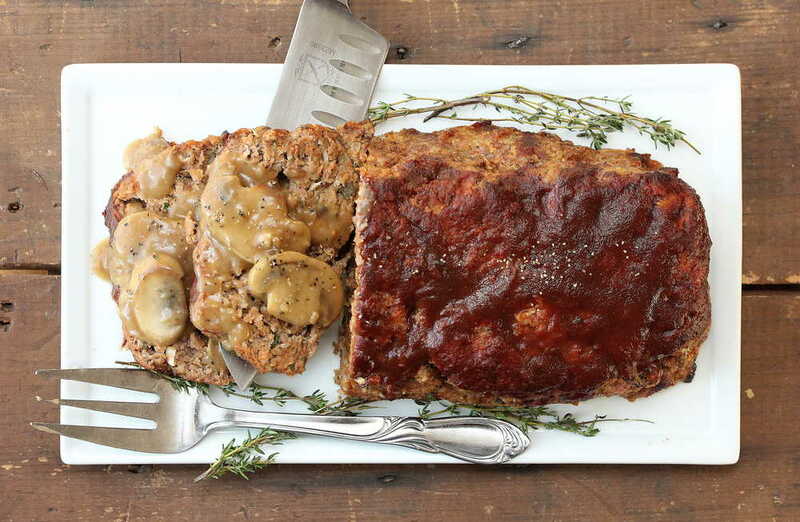 The flavor profile and texture of this dish is truly spectacular. And makes a gorgeous presentation when served. Scallops can be prepared numerous ways. From stir-frying, to deep frying, to baking, or our favorite: Searing. Cook them over medium-high heat just until they start to brown on each side. And oh yes, the sauce. The sauce. A thing of beauty without a doubt! This dish has honestly been a favorite in our house for years, and every time we serve to guests, they can’t stop raving about it. 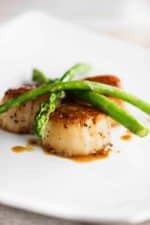 The scallops are so buttery melt-in-your-mouth delicious, and the asparagus is cooked until just tender and they are both complimented with the amazing pan wine and butter sauce. Oh my, this dish is so good. Okay, hopefully this has been enough to convince you to go make this awesome Seared Scallops with Asparagus recipe! You’re gonna love it!! We promise! Heat 1 tablespoon of oil in a large non-stick skillet over medium-high heat. Saute the asparagus, stirring every now and then, until tender...about 5 minutes. 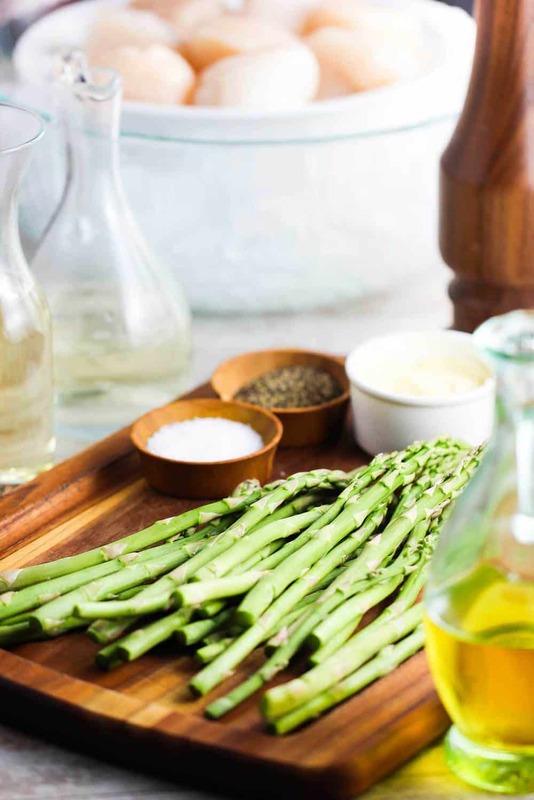 Transfer the asparagus to a plate. Don't clean out the skillet. 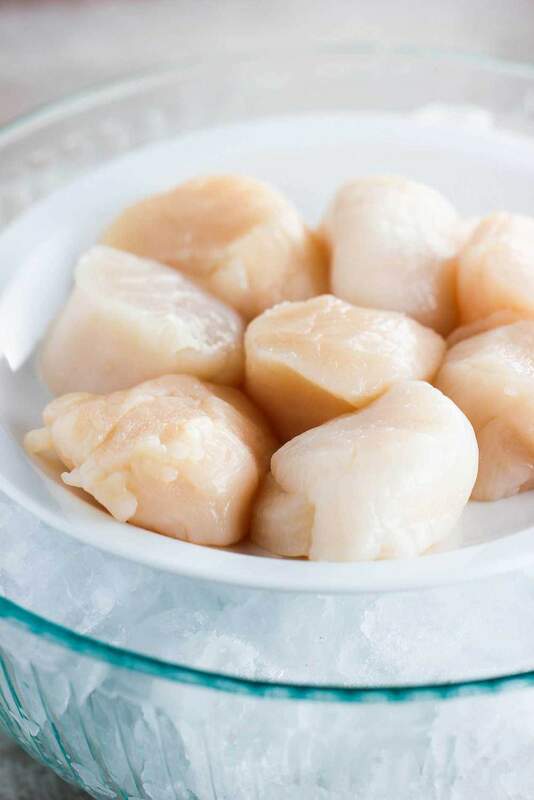 Pat the scallops dry with a paper towel, then sprinkle with the pepper and 1/2 teaspoon of salt. Add another tablespoon of oil to the skillet and heat over medium high heat. Saute half of scallops, flipping once, until nicely browned and just cooked through, about 5 to 8 minutes total. Transfer the scallops to another plate, as they are cooked. Wipe out skillet, and add the remaining oil, and repeat with the remaining uncooked scallops. Once cooked, transfer to plate (don't wipe out skillet this time). Carefully add the wine and vinegar to the skillet and boil, scraping up browned bits, until the sauce has reduced to about 1/4 cup, about 4 minutes. Add any scallop juices that have accumulated on the plate and bring to a simmer. Reduce heat to low and whisk in the butter, 1 piece at a time, until incorporated. Add asparagus and remaining 1/4 teaspoon of salt and cook for about another minute. 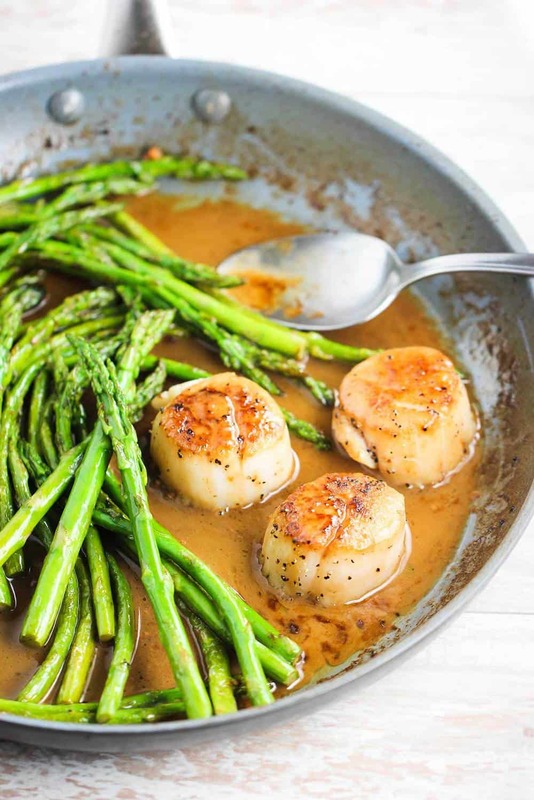 Serve scallops topped with asparagus and sauce. Great recipe. I didn’t have white wine so I substituted white balsamic vinegar and a honey ginger vinegar. Both are sweet and reduced well. Very flavorful. Nice change from savory recipes. Living in Oklahoma, I can only get wet scallops. I tried searing those once, and they just weeped and cried like crazy. Thought I’d never make them again. After watching you make your scallops, I got on the web and found out how to brine the wet scallops to remove the STP from them which apparently causes the weeping problem. I’m anxious now to try your recipe. I once had seared scallops in Crystal River, Florida and they were heavenly. Thank you for this recipe. Love ya’ll. It’s ‘sc ALL ups’ . You don’t say I have ail the marbles’. You say ‘I have ALL the marbles. Gosh, Jane. What is there to say, other, than ‘THANK YOU’ for taking the time out of your busy day to write this comment and bring this observation to our attention. I guess we should just GALLOP over to our linguistics handbook and learn how to not be so ignorant. Absolutely delicious! I could’t have been more pleased. I didn’t have any white wine so I substituted cognac, otherwise I followed the recipe exactly. I’ve only made scallops a couple of times and it was so long ago I barely remember. I am definitely a novice with any kind of seafood. I expected to finish and think “Ok, now I know what to do better next time”, but it was fantastic the first time! 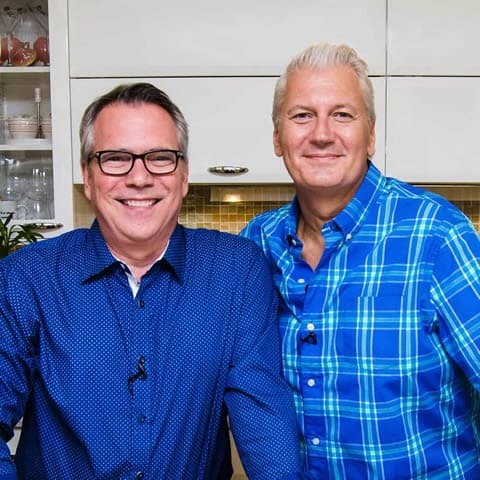 I’ve saved this recipe and will make it again! That’s awesome! I’m so glad you liked it. Aren’t those scallops melt-in-your mouth delicious?! Congratulations! Sounds like you handled this dish like a pro! And the congnac addition sounds really awesome. Thank you so much for letting us know…please stay in touch! Best, Kris (& Wesley).